It’s my not-OU today, and whilst I should really be sacrificing it to work on some content for a FutureLearn course, I thought instead I’d tinker with a workflow tool related to the production process we’re using. The course will be presented as a set of HTML docs on FutureLearn, supported by a set of IPython notebooks that learners will download and execute themselves. – ?separate image files (the images will also be in the Word doc). The way I have authored my week is to create a single IPython document that proceeds in a linear fashion, with “FutureLearn webpage” content authored using as markdown, as well as incorporating executed code cells, followed by “IPython notebook” activity content relating to the previous “webpage”. 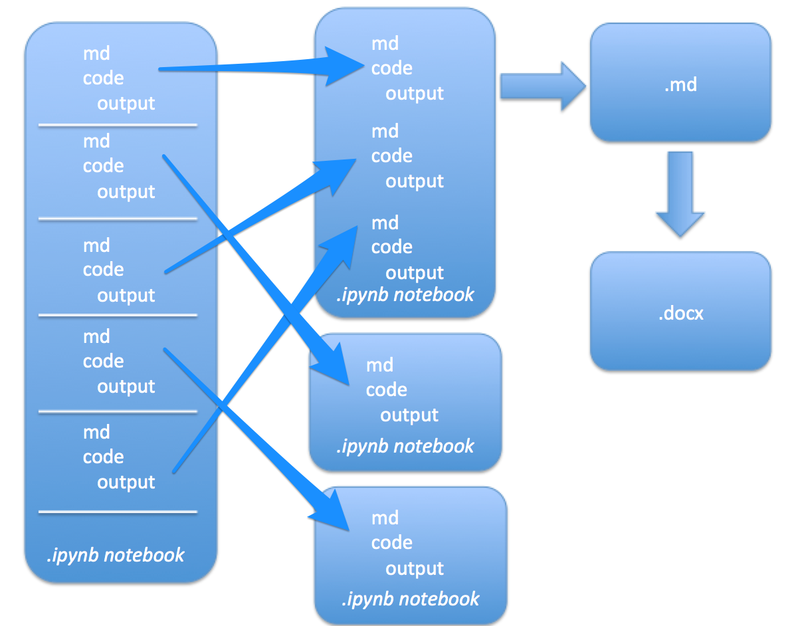 The “IPython notebook” sections are preceded by a markdown cell containing a NOTEBOOK START statement, and closed with markdown cell containing a NOTEBOOK END statement. uses pandoc to convert the monolithic markdown doc to a Microsoft Word/docx file. Note that it would be easy enough to render each “FutureLearn webpage” doc as markdown directly from the original notebook source, into its own file that could presumably be added directly to FutureLearn, but that was seen as being overly complex compared to the original “copy rendered markdown from notebook into Word and then somehow generate markdown to put into FutureLearn editor” route. #Are we in a notebook segment? What this means is that I can author a multiple chapter, multiple notebook minicourse within a single IPython notebook, then segment it into a variety of different standalone files using a variety of document types.